The Mini line-up has been evolving ever since its brand relaunch at the turn of the Millennium, with every couple of years or so a new model getting added to its very rewarding roster of vehicles and one more is about to make its way into the world in the form of the new Mini Paceman. Mini’s Paceman is built on the same platform of the beefy Countryman and is essentially a coupe version of the plus-sized Mini. Over the last few months we’ve seen what the standard Cooper version of the car will look like and most motoring publications have had a taste of what it’s like to drive, but the most exciting variant, yet to be given the full beans by the automotive press, is the John Cooper Works version of the new Mini Paceman. First seen just before Christmas and publically revealed at the Detroit Motor Show last month, the Paceman JCW sports a potent 215bhp from its 1.6-litre turbocharged four-pot, with all that power running through all four wheels in the form of Mini’s ALL4 system. All this means a 0-62mph of a very reasonable 6.9 seconds and a return of 38.2mpg. As with all JCW models the Mini Paceman gets a very sporty bodykit that consists of aggressive bumpers, deeper sideskirts and more than a fair share of JCW badges, not to mention 18-inch alloys as standard. Sports suspension is also part of the package and the JCW Paceman sits 10mm lower than the standard car, whilst a sport button in the cockpit allows for the usual heightened steering capabilities and a more visceral sound from the fancier double exhausts at the rear. 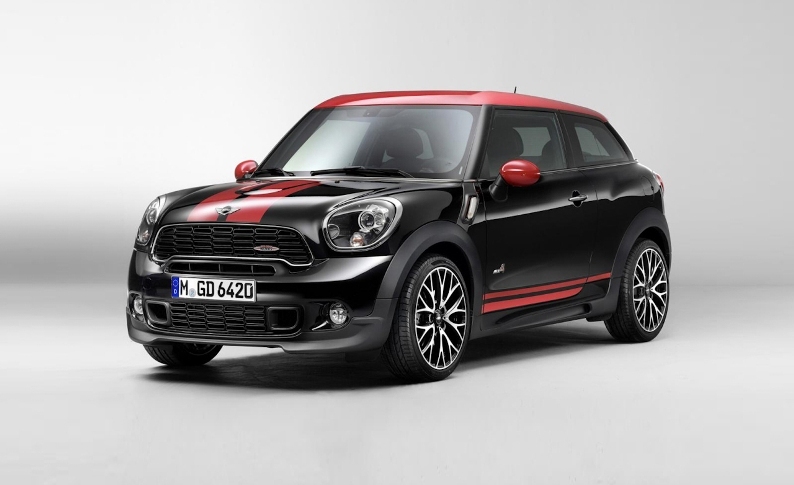 The JCW version will go into showrooms on March 16 –about the same time as the regular Paceman – and will cost from £29,535, which is £940 more than the equivalent Countryman model. If you feel this hot version might be a little too much, the conventional variant is priced more than £10,000 less and starts from £18,970.